I think I’m in love. It’s pretty rare for me to put more than 50 miles on a single shoe in one month given the number of reviews that I’m working on at any given time, but since mid-August I’ve run almost exclusively in two shoes: the adidas Gazelle and the Saucony Grid Type A5. I recently reviewed the adidas Gazelle, which is a truly awesome shoe, and next up is the A5, which I’ve managed to log 70+ miles in so far (including speedwork and several 13 mile plus long runs). Simply put, the Grid Type A5 has exceeded my expectations in nearly every possible way and has earned a spot on my feet for my Fall A-race – the Smuttynose Half-Marathon on September 30. I did try out the previous iteration of the Saucony Grid Type line, and it was not a positive experience. The Grid Type A4 never fit me quite right, and I managed to injure myself running a marathon in them a few years back (peroneal tendonitis). Thus, I was skeptical of trying the A5 since the sole was the same and only the upper had been updated. However, since the fit of the upper was my main issue and the A5 is a relative bargain among running shoes these days, I ordered a pair to review. I’m glad I did! I initially ordered the A5 in my usual size 10, but the fit was clearly still not right. I debated sending them back and giving up on the shoe, but opted to give them another try and ordered a half size up. What a difference a bit of space can make! The fit went from iffy to absolutely perfect, and the improvement over my experience with the A4 has been dramatic. I’ve come to the realization that my feet may have indeed changed shape as more and more I find myself opting for 10.5’s instead of my old standard size 10. The beauty of the Grid Type A5 is it’s simplicity. This is a no frills shoe, and that’s what I love about it. The upper is minimally structured and highly breathable, and for the most part it’s suitable for sockless wear (more on this below). There is a small plastic heel counter, though it extends only about halfway up the heel and is not really noticeable when the shoe is on foot. Arch support is present, though again minimal and barely noticeable to me. In terms of fit, I’d say the A5 (half-size up) is comparable to the Saucony Kinvara 3 – not particularly wide, but fits my foot without any noticeable restriction. I’d say it’s not quite as roomy in the forefoot as the Mizuno Universe, but a bit more roomy than the New Balance RC5000 (and much wider through the midfoot compared to the RC5000). For some reason, and I can’t put my finger exactly on what, Saucony shoes seem to fit me really well, which might be why I’ve had such good experiences with many of them. I mentioned above that I’d return to the issue of sockless wear, and here lies my one and only complaint about this shoe. I don’t like the pull-on-string on the back of the heel because when running sockless in them the knots that hold the strings in the holes in the upper rub against my skin and cause hot-spots. Not a problem with socks on. I’d recommend they ditch the string and instead use a pull tab attached to the outside of the heel. The sole of the Grid Type A5 is again brilliant in it’s simplicity. With a stack height of 16mm heel:12mm forefoot the shoe rides close to the ground, and at 4mm drop it nails my sweet spot for a racing or distance shoe. The outsole is substantial for a flat, with rubber coating the margins of the heel and grippy rubber nubs dotting the midfoot and forefoot. After 70+ miles mine have held up quite well – all of the nubs are still present and there is very little wear on any of them. Another feature of the sole are the drainage holes that extend up and down either side of the midline – these allow the A5 to shed water incredibly well, but do catch pebbles (though I I can’t feel them when lodged in so it doesn’t bother me at all). One of the things I really like about the sole of the Grid Type A5 is that because it has a low stack height, it’s flexible both longitudinally and torsionally (twisting). Good torsional flexibility has become one of the features that I look for in a shoe, and most traditional shoes with a big thick sole simply do not allow this. Torsional flexibility seems to prevent shoes from being too slappy. Finally, the A5 weighs in at 5.8oz in size 9 according to Running Warehouse (I wanted to weight mine, but they’re soaked after running 14 miles in them earlier today). Thus, it’s heavier than the Mizuno Universe and New Balance RC5000, comparable to the adidas Hagio (the Universe, RC5000 and Hagio are my other three top racing flat picks along with the Grid Type A5), but a few ounces lighter than a transitional shoe like the Kinvara. So, because they are racing flats, does that mean they won’t hold up as well/long as, say, the Kinvara would? I know racing flats are generally lighter and not meant for 100’s of miles of training runs, but could I train in this shoe and have it last a decent amount of time? What are your thoughts on training in racing flats in general? To be honest, there’s more rubber on these than on the Kinvara, and less foam to compress, so durability may even be longer. Hard to say since I’m only at 70 so far, but in the one pair of Kinvaras I wore to their death I got 200 miles. I think the A5’s might go longer. I’m a big fan of training in flats as they seem to work really well for me. What a coincidence! I had my fresh pair from running warehouse delivered Friday. I used your discount code on the green slime pair. $62 out the door, I was excited already. Then I ran in them on Saturday. Wow, what a fast and comfortable shoe. As soon as I put them on I thought “I have never had a pair of shoes feels so comfortable”. I did 5 miles faster than I have in the past few months. I have certainly found a race shoe for 5 and 10k’s. At 230 pounds, I am not sure if I could pound out a half marathon in them. Maybe motivation to lose that final 30 pounds. Yeah, tough to beat that price! You’re a great example of the fact that just because someone weighs over 200 pounds doesn’t mean they need to strap heaps of cushion under their feet – run well and your legs will do the work for you and you get stronger in the process. Thanks for the comment! You are correct Pete. I will never go back to overly structured and cushioned shoes no matter my size. I have been knee pain free in nearly 2 years since finding your site. I notice when I run in my Brooks Flow my form changes a little If I do not pay attention. I stand up and over-stride more since they have ample cushion. I fall back on letting the shoe do more of the shock absorption. When I wear my Kinvara’s and now A5’s I drop my stance and shorten my stride a little and let the legs cushion the steps and I can go longer and faster because of it. If I stand too tall and over-stride in these shoes my legs pay the price. The rest of this year I will be working on maintaining form no matter the shoe. Great site Pete! I recommend it to ever runner I meet. Thanks again Keith! These type of stories are what keep me going at it! I know that you feel – I agree, A5 is best shoes… my main pair of race shoes up to marathon! Would you consider running a Marathon in them, safe? Will the hold up? I’ve done it before with the A4, so yes. The A4’s didn’t fit me right, these I sized up so much better and would not hesitate to use in a marathon. I am a slow runner 6min/km and have run A5 for several Tris, 10km-21km. Really great lightweight shoe for race without socks! The only issue is the little rocks on the road may fill the holes on the bottom. Lucky most race roads are clear enough. I tried the Mizuno Universe and it’s just not enough cushion for my training runs. I run the the Kinvara 3 and find those great. Does the A5 have more cushion than the Mizuno but less than the Kinvara? Tough call – I’d say yes since the Mizuno is firmer, but the A5 definitely leans more toward the Mizuno than the Kinvara. If you feel you need a bit of extra cushion, flats may not be the best choice. Hi Pete, thanks for the review, very interesting. As my current go-to shoe is the Kinvara 3 I was wondering what you would consider the main differences? Which one is more “minimalistic”, which one is more durable? A5 is closer to the ground and firmer, so a bit of a different feet from the Kinvara, Fit is similar. More rubber on the A5, so may be more durable, but not enough miles on mine to know for sure. I am looking to add a pair of shoes to my rotation, which currently includes Asics Piranha (all time favorite), Saucony Hattori, Skechers GoRun, Nike Mayfly, and occasionally Saucony Kinvara. Would you recommend Skechers Bionic or Saucony Grid Type A5? Just bought these from runningwarehouse. I’ve taken your advice in the past (PureFlow, NB730), so I thought I’d give them a try. Hope they work out well! Great review Pete! Received my A5s from Running Warehouse last Thursday and will have a hard time working any of my other shoes into a rotation. The relatively small amount of cushioning has a feel similar to the NB 730s. So far just 6, 7 and 4 mile runs in them but there’s no doubt I’ve found my new race shoe. Sure can’t beat the price either. In most of your shoe reviews, you talk about the heel-toe drop of the shoe. Knowing that shoes get longer when you go a few sizes up, does the heel-toe drop grow as well (in order to maintain the same angle) or does the drop stay the same (which would mean having a smaller angle)? Personnaly, I would think it would be more important to keep the angle. Pretty sure the differential stays the same, so the ramp angle should decrease in a larger size shoe. This is the problem with kids shoes – ramp angle is magnified since they are so short. Shoe-angle and sole flexibility – I got my kid brother a pair of Nike Frees in Kid’s sizes (velcro + elastic lace is fantastic), and was quite shocked to see how comparatively inflexible the shoes are compared to my MR00, or adult’s Frees. I guess that’s part of the deal when you need to keep a minimum amount of rubber there for durability – the larger the shoe, the easier it is to make it flexible? That said, they’re still decently flexible, which is more than can be said for most kid’s shoes – and his gait is completely different compared to his previous shoes. Check out the Skechers Go Run kid’s shoe – very flexible both longitudinally and twisting. My daughter wears them. I agree: This is one of the best flats–heck, trainers ifn you go that way–on the market. I’d even like it a bit firmer, but still that isn’t a big deal when considering the shoe as a whole. Now that Saucony has the Kinvara TR out, I think this ought to be renamed the Kinvara Racer. What a holy trinity that would be. How does this shoe compare to the Kinvara 3? Never thought I’d be happy about an injury, but my wallet is thanking me for the PTSS right now. Forcing me back into Brooks Pure Cadence and Asics DS racers till it heals, prevents me from buying even more minimal shoes of the likes you review LOL! Always a silver lining with injuries! Makes me realize though that there is a big gap in the market for lightweight, 4-8mm heel, with a touch of medial support. S. Fastwitch, B. PureCadence, NB. 870 V2, and S. Guide are basically it. Also Saucony Mirage. However, the notion of medial support is nice, but shoes are never tested to quantify how much support they provide (or at least they don’t share with us), so we have no idea if one company’s support shoe is less supportive than another’s neutral shoe. We just take their word for it because they stick a medial post in or something like that. Medial posts aren’t even in contact with the ground when we are at max pronation. I know, and since half the models aren’t available locally its damn tough finding something that doesn’t cause the PTSS to flare up. The PureCadence so far work the best, but they are laterally canted and I don’t think that’s good long term for my knees. The cushioning, flexibility, weight, and drop in the A4s (haven’t tried the A5) hit the spot for me, and they were great for my marathon last fall. In my opinion they have one major caveat: the drainage holes in the sole make them a poor choice for wet/cold running. One step in a shallow puddle or even wet grass allowed water to enter the shoe from the bottom. As great as they felt, I had to shelve them all winter. Looks like the A5s are no different. I almost laugh reading some of your reviews because we share the same exact opinions on shoes. My closet is filled with Saucony’s because they have the perfect fit for me. No other brand of shoe feels as good on my feet. I’m currently putting a lot of miles on my A4’s. The thing is, when I first bought them, I hated them. My thoughts were similar to yours; they caused a lot of pain in my lower legs and made my feet feel like they were working way too hard at the given effort. I put them away for almost a year and then decided to give them another try. I credit the fact that I’m a much more efficient runner now, but I currently enjoy every mile in them. As an experiment, I’d say give the A4’s a quick run and see if your thoughts have changed. PS – I’ll definitely be buying the A5’s once my A4’s are worn out (which doesn’t look like it’ll be any time soon – about 200 miles on them and minimal wear). I should try the A4 again, but my suspicion is that the fact that I half-sized up in the A5 has made all the difference. I run a ton of miles on tough rocky and rooty trails in the A4. Even though they are seemingly sort for my size I have never blackened toe nails or had problems in long (20+) training runs I have another pair of size 11 (1/2 size larger) sitting in the box. They seem a bit long even though it’s a thumb width or less. I was wondering if the A5 was essentially the same sizing and one ought to go up 1/2 size. I love To use the A4 to switch between my Inov8 190s and 195s. I would say sizing is similar, half size up worked better for me in the A5, and makes sense since the A4 fit small on me. Good review. Like others here, we definitely share similar preferences in shoes. I’ve got 250 miles on a pair so far and they are still going strong. I bought the A5s this summer specifically for the drainage holes. With other shoes it was so hot and humid that I couldn’t run more than 45 minutes before my feet began sloshing around in my shoes and these totally eliminated that problem. I had a pair of the A3s (given to me free) and put a few hundred miles on them but wasn’t very enamored with them at all and tried on the A4 but it didn’t quite fit me. The A5 fits my long, moderate-width feet well. I wear the Green Silence, but I am looking for something with a little more flexibility and perhaps a softer ride. Is the A5 more of what I am looking for?? Probably not. 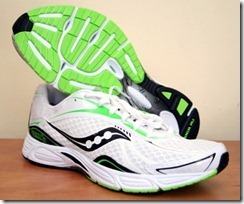 The Green Silence is one of the softest shoes I have run in, the A5 would be much firmer. The Saucony Kinvara would be more comparable in terms if softness. I have the A4. I really like it and have run quite a few miles in them all ready… but I seem to have developed tendinitis on the top of my foot. I’m not sure if it was from the fit of the A4 (they fit a bit tighter) or some other factor, but I’m afraid to run in them again. I’ll need to try out the A5 I think. I had issue with the A4 too – going a half size up in the A5 has made a huge difference! I’ve been running in the A5 for a week based upon your review- love it! Previously, I was in the Kinvara..Such a light shoe.. have to pull the reins back at times as it is easy to fly in these. Can’t believe I ran a marathon in Nike Vomeros a few years ago! One problem I’ve had is my third toe rubs against my second causing a cut/bloody sock….. In your experience, do you think the toebox is smaller in Saucony shoes? Trying to figure out if I am squeezing my toes together causing the problem or if it is just a toenail issue. Pete, the Mizuno WU4’s are my go to training shoe along with the Hattori LC’s. I like to train in what I would race. I know you touched on some of the similarities/differences between the A5’s and WU4’s, but can you elaborate on what you might typically select for certain types of training runs or races? Your WU4 review called them “near perfect racing flats”, and the fit between the WU4’s and the A5’s was significantly different if I remember correctly when I tried a pair on. Based on your latest review of the A5, however… I might just have to give them a whirl in my rotation. Yes, Saucony shoes do have a somewhat narrow toebox, but it accommodates my moderate width foot ok. I half-sized up in the A5’s and found that it has dramatically improved fit – probably my favorite shoe right now. It’s really tough to say – the Mizuno’s are lighter, and a bit roomier in the forefoot, but the A5’s just work well for me for some reason. Might be that the cushioning is tuned right for my body moreso than in the Mizunos. Both are great shoes, but I opted for the A5’s in my half marathon yesterday simply because I have had such a positive experience with them – 90 miles on them now and they are still holding up great. I’ve never owned a pair of racing flats in my life before, but I’ve gravitated more and more toward lighter/more minimal shoes in the last couple years, and your article pushed me to give these a try. I PRed in a 10 mile race this weekend during my second run in them, and loved how fast I could turn over in such a light shoe. Thanks for the recommendation! Awesome, glad they worked out! I bought my A5 about a month ago, it has become one of my favorites. I think it’s comparable to Adidas Haigo but 0.3oz lighter. For a racing flat, it provides very good amount of cushion, and looks like a traditional shoe ! Durability seems good as well, although too early to tell. My only problem with this shoe is the “drain holes” on the sole. It was designed to drain water during race, but unless you use it solely on track, it is easily clogged by either mud or small gravels on the road. I have to use a pair of scissor to pick them out. Complained about this to Sacouny, hopefully “A6” can fix this problem. Love reading your reviews Pete. I just made it to 1000 km on my first Kinvara 1. I just bought a pair of the 3. First run impression: good shoe as well. 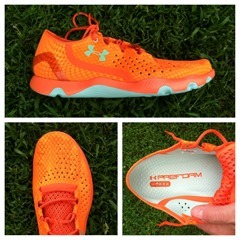 Hope the upper is more durable. On the a5: how many miles do you think they will last. As a raceshoe, is it expected to make much less miles? I will get at least as any miles out of them as I get out of a Kinvara (200 on my first pair of Kinvaras). Depends largely on how much you scuff the soles I suppose. Did you really already wear your Kinvaras out after 200 miles (320km)? Or do you just have to many shoes to take them further? I loaned them to a friend to try at 200 miles and he blew out the upper after two runs. I probably could have gotten more miles out of them myself. But, as a general rule, I don’t wear out many shoes since I’m a reviewer and always have new pairs to put miles on. I don’t know if anybody will read this, but still. I am a bit disappointed in the A5s. After not yet 300 km (less than 200 miles) they are starting to tear apart right besides both my tiny toes. I do not have this problem with any other shoe. Also the A5 makes my already sour ball of left foot feel worse. So while I liked the shoe the first months, it is now not in my top op favorite shoes. That top is reserved for Kinvara 3, Virrata and Adios Boost. Did you go half size up in the A5? Wonder if that would make a difference. Leo tu blog desde el otro lado del océano Atlántico, en Lanzarote, en las Islas Canarias (Spain). Lo sigo hace años y es muy interesante. Actualmente estoy corriendo en una Saucony Type A4 como zapatilla de entrenamiento, y lo que hice al comprarla fue escoger una talla más grande. Si normalmente uso una talla 10.5 USA, en la Type A4 uso una talla 11 USA. Aunque sigue quedándome algo apretada, es una de las mejores zapatillas que he usado nunca. Me recuerda a la Asics Hyperspeed 3 que tuve, pero con menor diferencia talón-puntera, por lo que la Type A4 es mucho mejor. Estoy deseando probar la Type A5. Como otros que han opinado, mi principal problema con la Type A4 son los agujeros que tiene en la suela, que se llenan de pequeñas piedras, pero la verdad es que en la carrera luego ni se nota. Es más la preocupación psicológica de que se pueda romper la suela con las piedras que la molestia real al usarlas. Te mando este mensaje para sugerirte que igual que escogiste una talla mayor para la Type A5, hagas los mismo con la Kinvara TR. En la Kinvara 2 llevo una talla 10.5 USA, igual que con la Peregrine 2. Pero leyendo los problemas de ajuste de la Kinvara TR me fui a una talla 11. Al probármelas me siguieron pareciendo muy estrechas, pero una vez que las usé, una auténtica maravilla!!. Muy planas y ligeras pero con suficiente protección. He usado para mis trails más fáciles las Inov-8 230, pero creo que la falta de amortiguación es lo que me provoca dolores en el dedo gordo del pie. Eso no me pasa con la Kinvara TR. Tiene suficiente protección, la placa anti-roca se acaba flexibilizando enseguida, y aunque no tanto como las INov-8 230, van muy cercanas al suelo. Me encantan las Kinvara TR! Te sugiero que les des otra oportunidad en media talla más. Thanks for this! Made good use of the 11 years of Spanish language study I did from elementary school to college. Can’t write very well anymore, but can still manage to read the written word en Espanol. As for your observations – the rocks in the sole of the A4/A5 can be an annoyance, but never bother me on the run. I’ve thought about trying to plug the holes, but they do help when running in the rain. 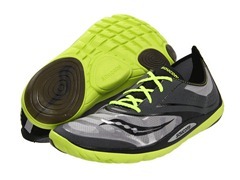 As for the Kinvara TR, yes, I wish I had sized up and given that a try. Unfortunately I bought them before the store’s return policy allowed for return of worn shoes, so I wound up selling them on Ebay. If I can get them at a good price I may try again, but I’m still disappointed that they don’t fit like the road Kinvara. Really appreciate this and all of your reviews and hard work. You are by far, my go-to resource on this kind of stuff. Now that I have finished my 1st marathon and before my next, I am using this time period to try a myriad of shoes. Have 12+ either in rotation or teed up to try over the next few weeks. Did an 8-mile tempo/hill repeat workout in the A5’s yesterday. Just loved them. Speedy, exceptionally light and very uncomplicated. I know everyone is different but not sure if I could get much distance on these past a half marathon. I was running in the Inov-8 155’s exclusively up until my long runs got to be 16 – 18 and it got to be too much. Curious if you have any thoughts about how far you would take it with them. Keep up the great work. Thank you for the recommendation on these. They have definitely made the cut! I ran a marathon in the A4 – it was mistake at the time since they were a half size small and I hadn’t trained much in them, but after a solid amount of training in the A5’s I wouldn’t hesitate to use them in a marathon, but that might not apply to everyone. I just ran my first run in the Inov-8 155’s the other day and they’re solid – similar feel to the A5, maybe a bit firmer. Appreciate the kind words as well! The A5 has been the best flat I’ve worn, too. I ran a 9 minute marathon PR of 2:38:10 in them yesterday. I ran my last marathon in the A3 and I really like the updated upper. The FlexFilm really makes up for the narrower toe box in my opinion. My only qualm with these shoes is the construction of the outsole. Of course, I don’t have perfect form and I’m sure I lose efficiency in the latter miles of long runs. The nubs on the outsole, though durable, have come off in high wear areas like under the fifth metatarsal and under the big toe. In my opinion, this shoe would be perfect if it had solid “plates” of rubber, like the NB1600, on the outsole, increasing durability. I’d say your form must be pretty decent with a time like that 🙂 Just ran in the 1600’s, and though I like them, the sole just feels a little dead to me. No pop. The A5 in contrast just works with me much better. Really enjoyed reading this blog as I’ve found myself getting more seriously into running and feel compelled to offer my two cents on the A5. I really wanted to like this shoe based on your enthusiastic review. I had planned to wear them for my half marathon coming up on Saturday. Loved the low drop and minimal feel, but the forefoot was too narrow for my feet in an 11. Sent them back and got the 11.5 but that just felt too big and ran like the shoe was working against my foot. However, they’re so light and they slip on and off so easy, I liked just wearing them around, almost like a sandal. But I finally had to admit that the A5 for a half marathon just wasn’t going to happen for me. So with just over two weeks left, cue panicked search for the right shoe to race in. I do as many runs as I can on trails (currently in NB Minimus 1010) and decided I wanted a little more cushioning than the A5 to deal with longer distances on the road. NB minimus 10 road was too firm, the NB 730 look nice but feel like they weren’t ever meant to actually run in (interested to hear more about the MR20 though), Brooks Pure Flow had too much structure under my arch, Kinvara was too narrow and felt like a lot of shoe as did the more traditional Gel-Lyte33, don’t like the fit of the Nike free and the Nike fly knit racer is like slipping on high heels. Apparently one’s feet can be pretty idiosyncratic. Eventually, Mr. Goldilocks found the Asics Hyperspeed 5 which is more a half-to-full-marathon racing shoe. It fit my wider feet perfectly, with some of the room in the toe box I’m accustomed to at the price of a slightly higher drop and a little more weight. Slipped them on and knocked out my final long run with zero issues. A little more forgiving on the roads, but with a nice springy feel very similar to running on a firm dirt trail. Also, have rubber outsole instead of the nubs. So worth checking out for those with slightly wider feet who still want minimal support and/or aren’t going to manage the longer distances in a shoe as firm as the A5. The A5 is a really nice shoe that would be ideal for my 5k-10k (and triathlon) needs were it just a little wider in the forefoot. Thanks for the feedback! The Hyperspeed is one of the few Asics shoes that I’d really like to try, but they are discontinuing it from what I have heard. 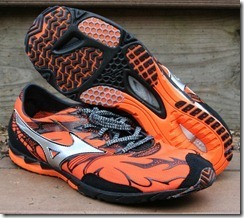 Another flat with a reasonably roomy fit is the Mizuno Universe. I’ve run over 300 miles on my A4’s, both training and racing, including my first half-marathon. Love them except for those stupid holes in the bottom – I put Shoe Goo in them finally! 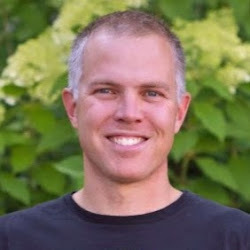 Pete, if you were to compare the A5 to the Merrell Bare Access 2, which would you pick? A5 is probably my top shoe of the year, I’d go with that one. Thanks! Ordered them yesterday and they are on their way today. I really like my gazelles and since I figured that was your other favorite shoe, I would go with the A5s as well. To be sure Pete, you run in Kinvaras size 10, and the A5s 10.5? My ordered A5s are undeliverable. And I hesitate to order them from abroad due to your sizing issues compared to the Kinvara. Looking at other shoes (some Adidas – adios2, feather, hagio – or mizuno) what would be your general top 5 of shoes for a next marathon? What would you run in? For a marathon, maybe the adidas Hagio for a flat would be my choice. Saucony Kinvara, Skechers GoRun 2, New Balance RC1600, Brooks Flow/Cadence would also be options for me. Thanks. Not the a5? Or any adizero? Nor the universe? Definitely the A5, but thought you were asking for others besides that one. Hagio is part of the adizero line, are you asking about the Adios? Decent shoe but a bit high in the heel and narrow in the toebox for me. Universe is also great, but may not have enough padding for me for a marathon. One month or so till Virrata release! I’m going to Saucony headquarters tomorrow so hoping to see it in person. Do you think you would like this shoe even more if it was zero drop, or do you prefer it to have the slight heel? Yes, very versatile shoe for me. MWU4, but are they just as comfy in the long haul? same feedback from the A5 as from the MWU4? My max distance in the A5 is about 14-15 miles, and felt great for that. Actually have not run a marathon since April 2011, but plan to get back to that distance this year. Part of the distinction may be that the A5 has a cushioned insole, which may not figure into published stack height measurements. Furthermore, the midsole of the A5 feels a bit softer and more responsive to me, not sure why, could just be a good match for my body and stride. I think with similar shoes like these it just comes down to personal preference. Fit-wise the Universe may be a bit roomier up front, but I don’t mind a slightly snug shoe for racing purposes. Thank you Pete. I appreciate the time you take in replying to posts. I look forward to reading more and your road to your next marathon. I tried reading through and I know you’ve recommended going a half size up from normal. I sort of fall in your boat about the Kinvara, my go to shoe these days (Kinvara 2 still). Since it’s such a similar fit, do you think going up a half size from the Kivara fit still makes sense, or roll with my 10.5 Kinvara size for the a5 as well? Hello Weasel, just this week I ordered a pair of A5s (via Wiggle) because of Petes enthusiasm. Sadly I could not get them in any regular store, so I could not try them on first. Despite of what Pete wrote I initially wanted to go for the same size as my Kinvara 3s and my Virratas (Eur 44/ US10). A reply from Pete to a mail from me led me to order half a size bigger (Eur 44,5/ US 10.5). I was skeptical when the shoes came, but the fit is perfect. And, with just one treadmill run on them I already like them. They feel remarkably soft for such a thin sole. Only thing I feel is unnecessary is that pull-on-string. I don’t have to use it. It looks okay, but weight is weight. It still is 29 grams lighter than my Virratas and 58 than my Kinvara3s though. I think this shoe might be a serious candidate for the Rotterdam Marathon April 14th. 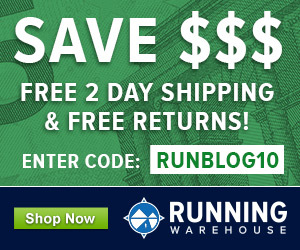 Have you tried the Kinvara or Brooks Flow/Cadence? May be a tad more space than the A5 in those. The new New Balance MR10v2 is 4mm drop and pretty minimal, but has a lot of space around the arch, might be worth a look as well. I picked up the A5s a week prior to running a marathon (bad idea, I know) and was fortunate there was no break-in time required. After 26.2 miles in them I am still happy and recommend them. I got the same size as the Kinvaras I was running in previously and the fit was perfect, even with socks. The only areas for improvement are filling in the holes on the bottom- they collect pebbles, and the string on the back is unnecessary weight. In my panic over my blown-out NB 730 less than a week before my half marathon this past Sunday, I ended up ordering an entirely new pair of shoes. Unable to find the Hagio, I went with the A5 after reading your review. I know that’s a terrible thing to do right before a race, but my shoes that were already broken in were nothing like the 730 I had been training in for the past month and I didn’t want to wear a heavier higher drop shoe. As you wrote, the A5 had a similar firm feel, drop was within 1mm and the weight was 1 ounce lighter. Your sizing tip and Shoefitr on RW steered me correctly to 1/2 size larger than my normal size. I ran my way to a huge PR in the A5 and I can’t wait to put more miles on them. Just wanted to say thanks! Awesome, congrats on the PR! I have a pair of Mizuno Wave Universe 5s and they are brilliant!! Unfortunately durability is one aspect of a shoe that I can’t comment much on. Since I review so many different shoes I rarely wear any of mine down. You might try asking in the forum. What’s up Pete, I’ve been checking in on this blog for years, and just today I ordered two pairs of the A5s at deep discount. I’m trying to decide on a shoe for a March marathon. My previous three marathons were run in two pairs of the Adidas Rockets (rip) and a pair of New Balance 730s. I haven’t done a marathon in the past two years since my daughter was born and have been running in multiple pairs Asics Piranhas (both 3 and 4). I have one pair of Piranhas 3 left in the box, but that won’t last me until March. I’m intrigued by these A5s and look forward to hitting the pavement with them. Great shoe, still one of my favorites. Not quite enough shoe for a marathon for me, but given what you have run previous marathons in my guess is it will suit you quite well. Good luck! I wore a brand new pair of A5’s for one interval workout 6×3 min plus maybe 20 cool down. The outer sole rubber practically peeled off completely on each side – after 40 minutes of use! I have returned these to Saucony. Hopefully this is just a defective pair. Nevertheless, I will not get another pair.